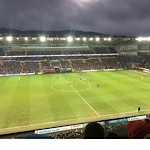 Cardiff City Football Forum | Cardiff City FC Messageboard • View topic - Is Arter banned for Tuesday? Is Arter banned for Tuesday? After his booking at Burnley? Re: Is Arter banned for Tuesday? Any player earning five bookings from his side's first 19 Premier League matches will have to serve a one-match ban in the same competition. Players who accumulate 10 yellow cards in Premier League matches up to and including their sides' 32nd fixture will serve a two-match suspension in the competition. Good news that we’ll have him available for the rest of the season, unless he picks up an injury or a red card.